Deadzone has arrived. I have unboxed it, cleaned and assembled the miniatures, built the terrain and played a game. It would be nice to have painted all of the miniatures, a process I’ve only just started, but I think I have enough information to give a coherent view of the product. I am not affiliated with Mantic in any way. I purchased the game myself. That said I do confess to wanting to like Mantic’s products. I like the character of their company. I like the idea of lower-cost miniatures to let gamers build armies instead of collect samples. I like how involved they are with their community and how excited they are about their own product. Deadzone is a boxed game. It comes with everything you need to play the game. The miniatures included in the box are more than sufficient to build a standard-sized force. The terrain is just enough to provide sufficient, though basic cover for a game. This makes this a great game for people starting in the hobby. 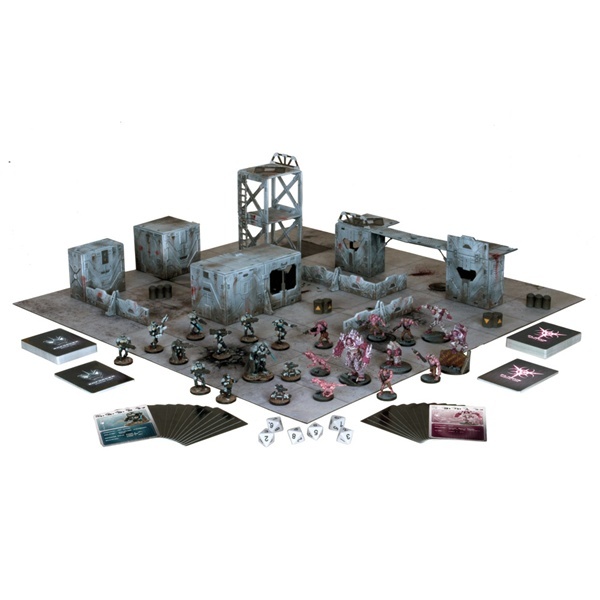 Deadzone Starter Set from Mantic Games. Image copyright Mantic Entertainment LLC. It appears as if Mantic even designed the box using a “game in a box” philosophy. The box is only half-full when first opened but after assembling miniatures and terrain everything fits comfortably inside. One could even commission some custom foam from Battlefoam to hold the miniatures alongside the terrain. Unfortunately Mantic didn’t think to add padding to the extra space, causing the heavy plastic terrain to rattle around and damage the miniatures. I think some air-filled padding or even brown paper is necessary to protect the game’s contents. When the game arrived the first thing I did was dig into the miniatures and start assembling them. I started with the Plague before moving on to the Enforcers. The Plague were difficult to clean but easy to assemble. Much of the mold lines ran through concave surfaces impossible to reach with file or blade. 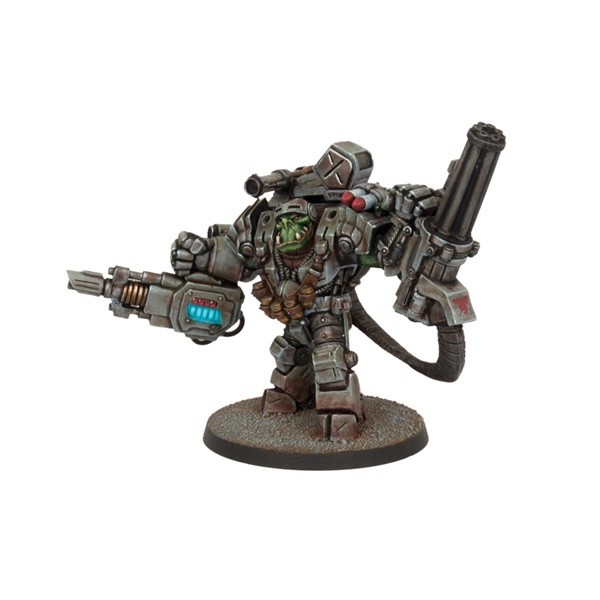 The Enforcers were easier to clean due to large areas of flat armour or slight convex surfaces. Unfortunately they were the most difficult to assemble with casting flaws making most of the arm-weapon joins impossible without significant cleaning of the male pegs of the join. Deadzone, image and game copyright Mantic Entertainment Ltd.
I’ve read a number of forum and blog posts on the restic material used in the miniatures. I like it and don’t find it terribly difficult to work with. It does tend towards post-cast warping and I’ve seen a number of casting flaws that I associate with casting errors. I don’t know if they use steel or rubber/silicone molds for restic. It appears they are using rubber/silicone and are using 2-3 part molds. I say this because many parts, including the Enforcer Captain’s cloak show more than a single continuous mold line. When these occur the alignment of the third part of a mold (I’m guessing this would resemble a smaller plug inserted into the two larger mold parts) appears to be off, resulting in a very noticeable 1mm escarpment where one would expect to normally see a mold-line. In addition to these obvious casting errors there is a lot of soft detail which is either a sign of a poor sculptor or bad casting. Overall, I would say that these miniatures are or poor quality and would be a frustrating experience for anyone trying to achieve a collector’s standard of modeling and painting. At first glance I was very impressed with the terrain. I completely didn’t get a sense of how thick the walls were until I actually held them in my hand. The pieces are at least 5mm thick and cleanly cast. Assembly was a different story. Depending on the type of wall or roof tile the fit between tile and connector was either very tight or very loose. To get things to fit perfectly requires a lot of careful filing. Too little and they won’t connect, too much and they won’t hold. If you plan on not gluing your terrain expect a lot of careful filing to get the fit right. Also, expect a lot of chipped paint and a massive setup and tear-down time requirement. As much as you can use the terrain without glue I really think that isn’t the optimal path. In addition to chipping paint and taking forever to setup and put away you also can’t paint the parts in a way that suggests direction. Directional highlights, oil, rust and blood drips all need a consistent “up” to look right. As I’m planning to paint my terrain using those weathering and highlighting techniques I want to paint my terrain in a permanent setup. There will be a small amount of flexibility lost gluing the terrain but not that much. My plan is to build smaller structures that work on their own and can be combined to form larger, more complicated buildings. The amount of terrain was a bit of a letdown. I’ve only seen examples from people with access to multiple sets of terrain. I wasn’t able to build as much or as high as I thought I would although I feel there was enough terrain to make the game interesting. I plan on adding additional terrain built either from foamcore and card and buying more sets of Mantic’s Deadzone terrain. We played a game of Deadzone during one of my bi-weekly boardgame nights. We had two players a side, not the standard complement, but I mostly looked up rules and let my buddy control our force. We started at 8:30 and were done by 10:45. We had a lot of trouble getting started and were constantly having trouble finding rules. I really wish the book was better organized. I’d like to see a logical layout based on what you need to know when you sit down to play a game and in what order. I imagine that two players who are familiar enough with the game to not constantly look up rules could play a round in around an hour. This is perfect as it should allow multiple games during an evening, or playing during a weeknight. I haven’t had a chance to play the campaign yet and won’t comment too much on the system. Compared to Necromunda, a game I really enjoyed and the reason I was so interested in Deadzone the campaign system doesn’t contain as much detail. You don’t locate and buy better weapons for your troops. Instead you buy a different troop type. The other strange-seeming campaign rule is although you unlock better troops or improve the troops you have you never actually gain an advantage. All improvements increase the model’s point cost and games are always played at an equal points cost. Before I judge, however, I want to play at least part of a campaign. Maybe it all works. Certainly the rules should mean each game is fun for both players regardless of their standing. At the end of the day I am very happy with my purchase of Deadzone. I would have liked to see higher quality miniatures but since I was planning only quick and simple paint-jobs it isn’t a big deal for me. My players enjoyed the game and the portability and quick play should make running a campaign a real possibility. I hope to have some images of painting miniatures soon and once my set is complete I may create some battle-reports. I imagine it should be really easy to record a game using the grid. Have you played Deadzone? Let me know what you think in the comments. Happy Gaming. Cool. Thanks for the review. Seems like a decent acquisition. It should. I was a little worried that the campaign wasn’t as crunchy. There aren’t a bunch of different guns each guy could use. I hear that the campaign works well though, and should be easier if you want to try for wysiwyg. I’d like to know what happened between “campaign” and “final thoughts” that changed your mind about the game? I’m considering trying the game out. I’m a big fan of Mordheim, and always wanted to try Necromunda, but never had the group interest. I’d like something a bit easier for players to get into. I think that although the campaign system isn’t as detailed as Necromunda’s this doesn’t make it worse. It depends on what you liked about Necromunda. Did you like naming each of your guys and converting them each time they changed their weapon, or was it a pain to remember that your Cawdor ganger with a lasgun was actually carrying a bolt pistol, or perhaps two chainswords. This is a definite advantage with Deadzone’s campaign system: Since you aren’t swapping weapons on a specific model there is no requirements to convert miniatures to be WYSIWYG, which also makes it easier to see what your opponent has. Unfortunately you may want to hold off on Deadzone for now. They are currently remaking it and I expect the campaign system to get an over-haul. Although for the amount of miniatures and terrain in their main boxed set I don’t think buying it knowing that that the rules are about to change would be a big mistake. All the minis and terrain will still work in the new version. I didn’t get to try Necromunda, but I did like that about Mordheim. However, I can live without it, provided there are other elements to the game that make up for it. I’m a sucker for customizing options for heroes and such, I hope they come up with something like that. Mantic has really been putting out some solid games as of late.